Well, new to me anyway. 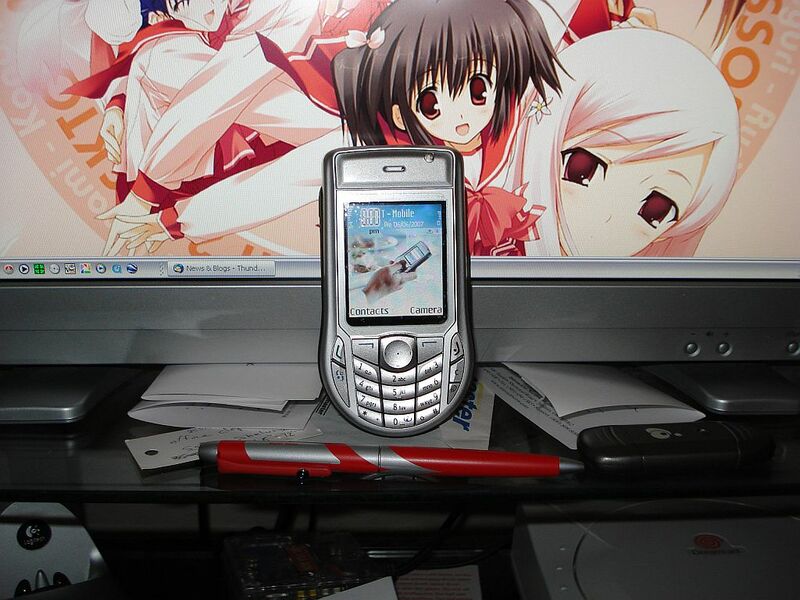 eBay angst is over as I have now received the Nokia 6630 I bought about a week ago. No box, mind you, and the manual is in Danish, but the phone itself is in fine shape – the previous owner had it in a protective, if rather ugly case and had a screen protector on besides – I left the screen protector on if you’re wondering why the screen looks so dodgy in the photo. The QR code recognition app is … well, it’s not been perfect but it may just be that I need to tweak things. It reads QR codes off computer screens just fine, but it has problems reading them off paper. It took me a little while to get it paired with the Mac mini, but now that I have, it talks to iSync just fine and I can send it files via bluetooth – so I have my hamamatsucho station ringtone and life is good. Can’t seem to browse it from the Mac to get photos off but that will come in time, I’m sure. 2 Responses to New phone! Did you try the Kaywa Reader (http://reader.kaywa.com) or is it a Nokia Barcode Reader? I was using the Kaywa Reader. It works pretty well for all of their test QR codes and some of the QR codes I’ve found on web sites, but it doesn’t do very well with high-density QR codes or codes off paper. I suspect it’s because the 6630 either doesn’t have a macro mode or because, as their site says, they can’t activate the macro mode on the camera… yet. There’s another free QR code reader application out there but I haven’t tried it yet, I’m waiting until I get an MMC card so I have enough room to actually install and play around with applications without worrying about running out of phone memory.